But oh! The shame of Aspartame! or drinking water for the rest of your life? And I don’t mean Coke or Pepsi. I’m not talking Virgin Cola or Virgin Active. Not banana shake or bubblegum. I mean listen to what the whales are saying and choose. hollered in your holy sinews and choose. to the lean heartbeat game of game views and choose. My tummy ache is a part of me. coated by unseen painters and players. Molweni! Sawubona! Bonsoir! Goeienaand! Greetings! Tonight I welcome you to my table. and then let us eat. Will rise in sandstone dreamblocks and shine for all. 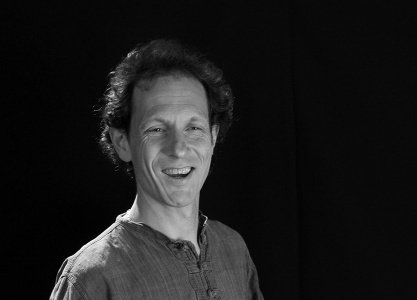 Simric Yarrow is a performance poet, award-winning actor, musician and teacher based in Muizenberg, Cape Town. Recent performances have included collaborations with musicians Jamie Jupiter and Chris Tokalon, and visual artists Claire Homewood and Mike van Rooyen, as well as featuring at Badilisha’s Fire Word Fridays and Poetry on Long. His first collection of poetry, Flying on the Lucid Fringe was published in 2009. He is also known for the poetic house he built with his wife Carey – a unique double-storey mud and straw affair proving that you can be eco-friendly in the suburbs.